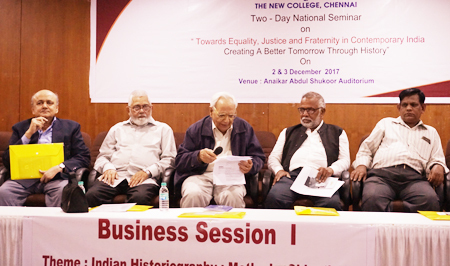 A two-day national seminar on “Towards Equality, Justice and Fraternity in Contemporary India – Creating a Better Tomorrow Through History”, was organised by the Institute of Objective Studies at Chennai on December 2-3, 2017 in collaboration with The New College, Chennai, as part of the 30th Anniversary Celebrations of the Institute. 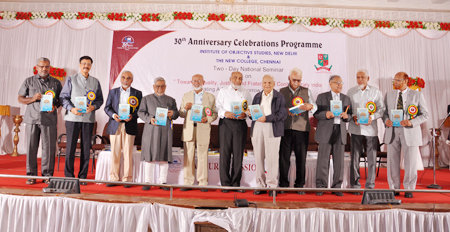 The response of the academia and the intelligentsia of Chennai was overwhelming as was evidenced by their presence in large numbers. The standard of the papers presented by scholars was high as the study of Indian history, particularly medieval and modern, was discussed threadbare. Almost every aspect of history, including the writing of history and its methodology, was discussed in detail. Academics who read their papers, shared their knowledge of history they acquired during their career as researchers and teacher. The keen interest evinced by the audience was reflected in the level of sophistication and number of questions and supplementary questions put to the speakers. The engagement of the audience with speakers was proof enough of the curiosity generated by the topic to know more of history. The seminar was formally opened with the recitation of a verse from the holy Quran by Dr. Abdul Latif, who also rendered it into English. In his welcome address, the principal of The New College, Major (Dr.) Zahid Husain, took pride in holding the seminar again in his college after a lapse of eight years. He expressed the confidence that the deliberations at the seminar would benefit the new generation. Introducing the subject, Secretary-General of the IOS, Prof. Z.M. 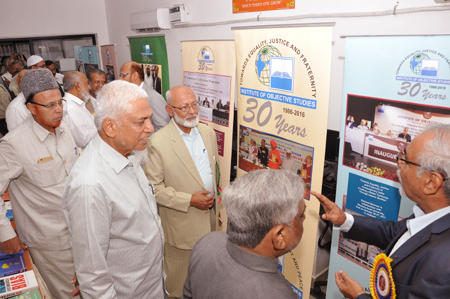 Khan, said that the Institute had completed 30 years of its existence and it was natural to celebrate it by highlighting the lofty ideals of equality, justice and fraternity that were the bed-rock of the Preamble to the Indian Constitution. This was the fourth such seminar of the series, which would be rounded up in February next in Delhi. He informed that every possible effort would be made to draw up an action plan based on the conclusions of these seminars for use by the implementing agencies regionally, nationally and internationally. He said that the IOS was concerned with the methodology to study and research at advanced level. He briefly listed the activities of the IOS which, among others, included sponsoring research and other projects within its resources, organising national and international seminars, awarding scholarships to students pursuing PG courses and Ph.D., and madarsa students studying in higher institutions of learning. The IOS was seized of the national issues, which was illustrated by the letter it wrote to the Election Commission of India apprising it of the findings of a committee on the use of EVMs (electronic voting machines). 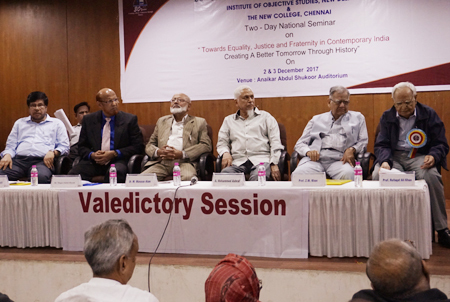 In his inaugural address, ex-judge of the Madras High Court, Justice Akbar Ali, complemented the IOS for unceasingly striving for the uplift of society. He said that though the Preamble to the Constitution set the goal to achieve equality and justice – economic, social and political – for all the citizens of the country, it was deplorable that the country was far from achieving that goal even after decades of Independence. It was time to brood over the plight of Muslims, who had been constantly discriminated against. This also raised the question if Muslims ever endeavoured to educate their youth about history, equality and justice in true perspective. It was the need of the hour to acquaint the youth of the North with the real history of the South and vice-versa in order to bridge the gap of understanding of each other. In spite of the presence of a number of universities in the country, the youth were still ignorant of “our part in our freedom struggle and the supreme sacrifices made by our forefathers”. This oversight must be a matter of concern for everyone. He called upon institutions working in the field of research to join the IOS efforts in disseminating the outcome of the seminar and taking it to other communities in general and Muslim community in particular. He made a special reference to the noted social activist, Ram Puniyani, with whom he discussed the issue a few years ago. The key-note address was delivered by the Director, Centre for Freedom Struggle and Diaspora Studies, and Chairperson of the Faculty of History, School of Sciences, IGNOU, Delhi, Prof. Kapil Kumar. 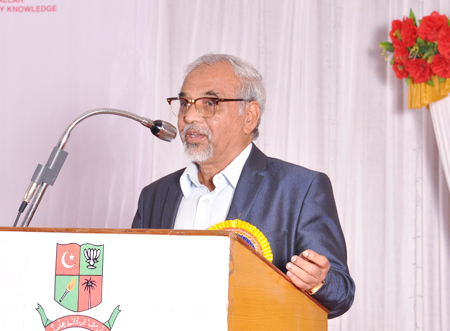 In his speech Prof. Kumar noted that there was no platform except the studies of news channels to discuss issues. These discussions were dividing the country, widening the gap between the communities. While the British adopted the policy of “divide and rule”, today Indians were ruling to divide. Holding that history was not a dead subject, he said that Indians were blinded by the light which came from the front, but forgot their way into the past leading to enslavement of their mind and intellect by the West. Lampooning Marxist historians for economically analysing history, he held that they did not analyse history from the psychological perspective. Colonial psyche had been predominantly influencing history writing. Karl Marx, too, walked into this trap. Marx’s interpretation of India was based on colonial sources. Western scholars denounced India by saying that there was no country like India. Tracing the history of resistance to the British rule, he said that it was the faqirs and sanyasis of Bengal who first raised the banner of revolt against the British decades before 1857. He did not accept the uprising of 1857 was the first war of independence and criticised Karl Marx and the veteran communist ideologue, P.C. Joshi, for treating it as such. He said that the so-called namak-harams of Delhi were informers of the East India Company who used to regularly brief the officers of the Company and advise them to attack Delhi on Eid-al-Adha when the Muslims would be busy performing animal sacrifice. Commenting on secularism, he said that it was a euphemism and an abuse of the word, for India was never a secular state. He called for a fresh study of India’s history to know who facilitated creation of Pakistan. Thus India’s independence should be celebrated as half-independence. He observed that the first death of secularism took place in 1939 when Maulana Azad was fielded from a “safe” (Muslim) constituency. He also sought to know why the Frontier Gandhi Khan Abdul Ghaffar Khan did not find a place in history books. Instead of telling the true history of India to younger generations, historians were either rightists or leftists. The British wanted Indians to subjugate Indians and this psyche still continued. He suggested that nukkad seminars (street corner seminars) be organised in which the participation of common people be ensured so that they also knew of their glorious past. 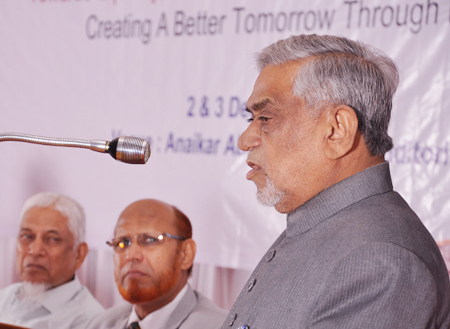 The Vice-Chancellor of Maulana Azad University, Jodhpur (Rajasthan), Prof. Akhtarul Wasey, while addressing the audience as guest of honour, observed that what was in the interest of the country was also in the interest of Muslims, who constituted about 18 percent of the population and wanted India to take strides in development. They were interested in India’s advancement in every field. Referring to history, he said that everything in it was not worth remembering and such things should be erased from memory that divided Indians. He said that people were oblivious to the contribution made by Abu Rehan Al-Beruni, who travelled most parts of the country, met Pandits and engaged with them on matters of Hindu religion and philosophy. Instead of him, Max Mueller was described as the first Indologist. Al-Beruni’s book Taarikh-ul-Hind (History of India) was translated during Akbar’s time, but today it is ignored as he was a Muslim. He stated that Aurangzeb was a devout Muslim and offered five times namaz, but put his brothers to death. There was no reason why we should carry the burden of investing Muslim rulers with the title of Amir-al-Momineen (Chief of Muslims). He held that sufis played the main role of spreading the teachings of Islam with love and compassion, but the rulers did everything possible to establish and expand their rule. Referring to the creation of Pakistan, he said that the feudal lords were instrumental in creating it for the sake of their fiefdom. One mistake in history could make generations suffer for centuries. He warned that any attempt to create another Pakistan would be resisted tooth and nail and, in no case would it be allowed to succeed. He said that synthesis could be arrived at only after thesis and anti-thesis. In order to establish a connect with the other communities, dialogue should be organised not only at macro level, but also at the micro level. Muslims should take a lead in such dialogue. Pitching for secularism, he remarked that it held the country together and the term should be defined in Indian perspective. He struck an optimistic note on the unity and integrity of the country. 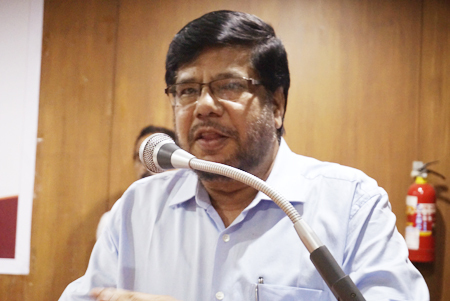 Former member, National Disaster Management Authority, Chennai and ex-director-general of police, Tripura, Dr. K. Saleem Ali, wanted to know if the goals of equality, justice and fraternity as enshrined in the Constitution had been achieved. He replied, “No”. Today’s rulers had discarded all cardinal principles. He said that Babar and Aurangzeb were deliberately chosen to raise a storm. Jizya was imposed by Aurangzeb to meet the exigencies created by a draught that raged during Aurangzeb’s reign. Referring to the Taliban, he said that it was the creation of Western powers. Thus, history needed to be thoroughly researched. Since history was a subject of enquiry and required scientific treatment, it must be classified as a science subject. It should no longer be treated as an arts subject. Elaborating, he said that history was a study of the past as also an enquiry and investigation of the knowledge acquired by research. Quoting Winston Churchill, he said, if you want to make your future you must go into your history. But today, history was being used to divide the country. Commenting on socio-economic inequality, he observed that this was exacerbated after 1991 when economic liberalisation paved the way for capitalism dealing a death blow to socialism. This resulted in the accumulation of 28 percent of wealth by one percent of population. He noted that India was an agrarian economy and historians should delve into this aspect. There were several dark areas, like the life of the common man, dispensation of justice and gender bias which needed to be studied by historians in a more objective manner. Referring to the delivery of justice, he said that the pace of judicial administration was slow, which was exemplified by cases pending disposal in various courts. There were as many as 22 crore cases pending in different courts of the country. “Could it then be called justice?” he aked. He said that it was regrettable that the rules followed during Ashoka’s period were still being practised. Rules were practised to take care of rulers. Absolute British laws were still in practice and it was long overdue to make progressive and new laws. He remarked that India had always been used for political purposes with emotional appeal playing a dominant role. We would be accountable to future generations for our past actions, he added. In his presidential address, Chairman of the IOS, Dr. Mohammad Manzoor Alam, expressed satisfaction that the seminar evoked a huge response. He said that at the Institute, “we believe in thinking, sitting and working together”. 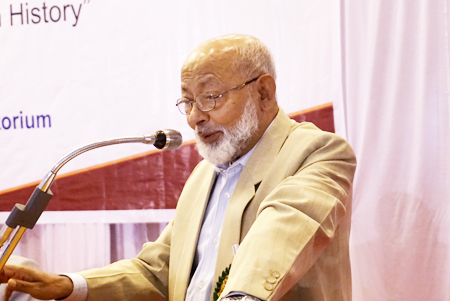 In his written speech, read out by Dr. Major Zahid Husain, he noted, “History, being the record of events, can turn into a double-edged sword, cutting both ways, having the potential to help as well as harm. The saying that those who do not remember history are condemned to be revisited by history at adverse play may not always be true”. He said, “History may not necessarily repeat itself with all its horrors: massacres, enslavement, famines and disasters. However, there is certainly a recurring pattern of human relations, human interactions and human predicament in it that has to be observed, taken note of and used profitably as reference points”. He observed, “History writing has always been the domain of power. It began with the chronicling of the deeds of kings and emperors, celebrating their extraordinary feats. It began to change after the 18th century. Still it was being written in the interest of the upper classes, talking about their role in national life. Even the idea of nation was appropriated by these classes and historiography reinforced those ideas”. He continued, “Today, there are half a dozen major schools of historiography that cover a lot of ground largely de-hegemonising the ownership of nation and history. Yet, in India, the Sangh and its myriads of organisations have misappropriated the nation and, through a convoluted logic, have been justifying the constant violence against, and marginalisation of, persons they think constitute the ‘non-nation’ – Muslims, Christians, Dalits, tribals – as legitimate actions in support of the ‘national’ cause. Anybody objecting to such marginalisation and vilification is branded anti-national, boycotted and hunted”. He appealed to the experts of history to rededicate their efforts to salvage history from debasement and pay it the attention it deserved. 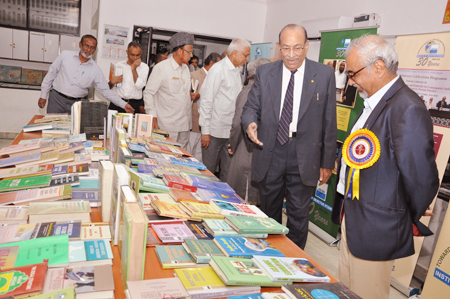 The occasion was marked by release of two books published by the IOS. The Role of Muslims in the Indian Freedom Struggle (1857-1947) Volume-I, II and III (Hindi Translation) was released by Justice Akbar Ali, and Building up an Inclusive Civilisation in India: Experiments in Good Governance and Human Rights by Muslim Rulers under IOS Lecture Series by Prof. Refaqat Ali Khan, was released by Prof. Akhtarul Wasey. The IOS Calendar for 2018 was also released on this occasion. Dr. M.S.A. Jafarulla Khan, head of the department of historical studies, The New College, and co-convenor of the seminar, extended a vote of thanks. 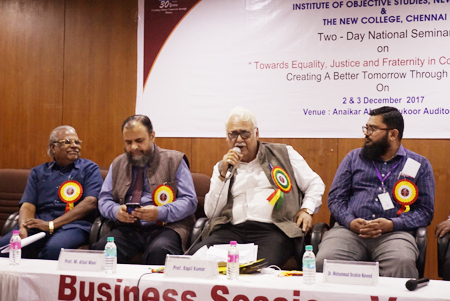 The inaugural session was followed by business session-I with Prof. Refaqat Ali Khan, former professor of history, Jamia Millia Islamia and vice-chairman of the IOS, in the chair. The theme of the session was “Indian Historiography: Methods, Objectivity and the Capability to Shape Perception”. 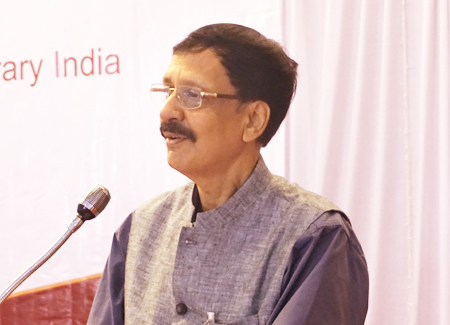 Speaking on “Medieval Indian Historiography with Special Reference to Ziya-e-Barni”, former professor of history, Jamia Millia Islamia, New Delhi, Prof. Syed Jamaluddin, said that Ziyauddin Barni spoke of truthfulness and impartiality. Iranian culture dominated during that period and Persian historiography, in contrast to Arab historiography, was limited in scope. He observed that Barni was a historian not by choice, but by compulsion. He was from the Turkish stock and turned a blind eye to the changes taking place during his times. He was class-conscious, but objectivity was praiseworthy. Barni’s likes and dislikes were manifest, and his books commented on the socio-economic and political trends of his times, he added. Journalist from Delhi, Mohd. 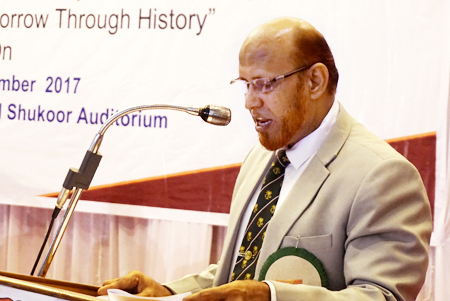 Zeyaul Haque, said that historiography’s truthfulness was sometimes doubtful causing a trust deficit in history and historiography. Elucidating his point he said that the Indian national movement, if viewed from a Marxist angle, would be different from the nationalist perspective. Referring to Garhmukteshwar riots of November 1946, he said that the number of those killed in the violence differed widely between Indian, Pakistani and British accounts. So did the attribution of guilt. 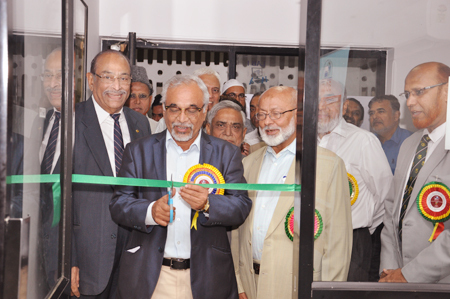 Dr. Fayaz Mohammad Bijli, head and associate professor, P.G. 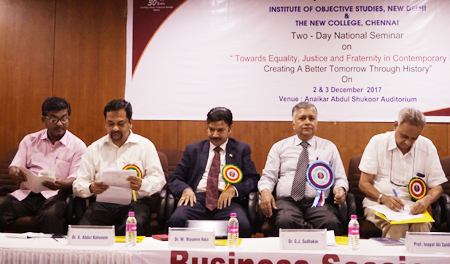 and Research Department of Commerce, The New College, elaborated on “Religious Freedom under Secularism in India”. He said that religious freedom had been enshrined in the Constitution. 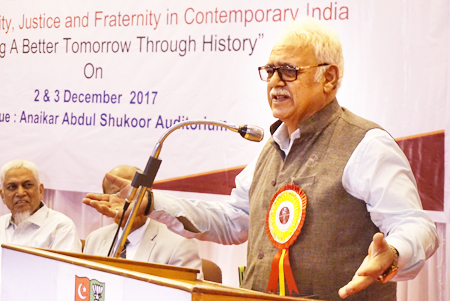 Shaikh Nizamuddin, member, General Assembly, IOS, who spoke on “Indian historiography”, held that Western scholars wrote Indian history by concocting facts. This process began after the Renaissance. Colonial history was biased against Muslims. Western scholars did not do justice to Muslim contribution to the world. Several Indian historians’ outlook about the medieval period smacked of communal bias against Muslim rulers. Referring to Dr. Ambedkar, he said that he, too, did not remain untouched by communal predilection. He called for a multi-pronged approach to the study of history. Business Session-II was the last session of the first day. 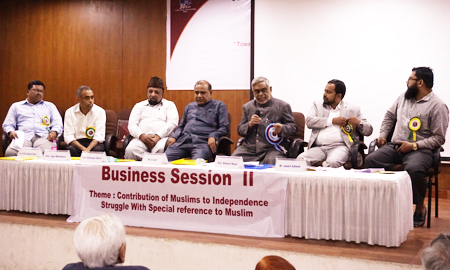 Its theme was “Contribution of Muslims to Independence Struggle with Special Reference to Muslim Clergy” Prof. Akhtarul Wasey presided over the session. A.U. 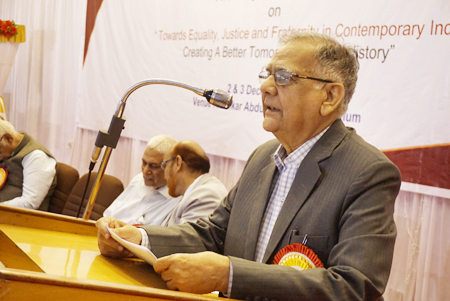 Asif, editor, Urdu Chauthi Duniya, who spoke on the “Role of Urdu Media in Freedom Struggle and Reconstruction of India”, held that the role of Urdu and regional press was much larger than that of the English press. The Urdu newspaper Waqf, which was being brought out from Indian part of undivided India, later shifted to Pakistan. The Dawat was being still published from Delhi. He emphasised the need for further study of the role of the Urdu press during the freedom struggle. Prof. Jigar Mohammad, professor and head, postgraduate department of history, University of Jammu, Jammu Tawi and Prof. Ishtiyaque Danish, former professor of Islamic Studies, Jamia Hamdard and Finance Secretary of the IOS, spoke on “Theologians and the national movement”. While Dr. K.M.A. Ahmed Zubair, assistant professor of Arabic, The New College, shed light on “Azad’s role in Nation-building: An Educational Perspective” Jameel Aahmed, assistant general secretary, All India Milli Council, Karnataka, spoke on “Religious and Cultural Impact of Islam on Hindu Society (With Special Reference to Bhakti Movement)”. 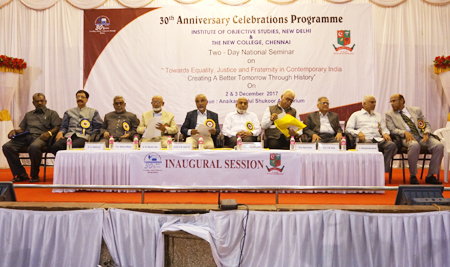 The second day began with the third session which discussed “Civilisational Contours of Indian History”. Chaired by the head, Centre for Historical Studies, CPR Institute of Indological Research, Chennai, Dr. G.J. Sudhakar, the session had Prof. Inayat Ali Zaidi, former head of the department of history and culture, Jamia Millia Islamia, who spoke on “India in South Asia: history of good governance, social peace, development and prosperity”. In his paper, he described the present situation in the country as volatile. There was also an issue of good governance. India, Afghanistan, Pakistan, Bangladesh and Sri Lanka shared a common tradition in several respects. Ahimsa and Sulah-i-Kul were part of it, he said. Dr. M. Waseem Raja, associate professor of history, Aligarh Muslim University, presented a paper on “Growth of Syncretic Cultural Ethos During 17th -18th centuries North India: As gleaned from Urdu and Persian Sources”. 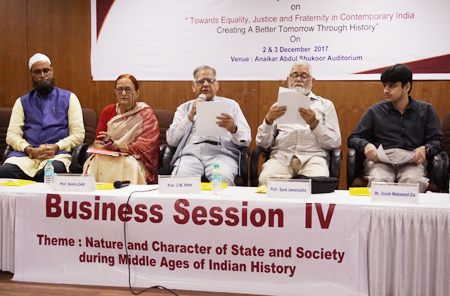 Business Session-IV focused on “Nature and Character of State and Society during Middle Ages of Indian History”. Prof. Z.M. Khan was in the chair. While former head of the department of history and culture, Jamia Millia Islamia, Prof. Sunita Zaidi, spoke on “Images of Indian Women in the 13th and 14th Century: Arab Travelogues”, while Prof. Syed Jamaluddin spoke on “Nature of State under the Delhi Sultans”. Dr. Abdul Gani, senior lecturer, department of history and archeology, Anjuman Degree College, Bijapur, Karnataka read a paper on “Nature and Character of State and Society under Deccani Sultanates”. The last speaker of the session was Zoyeb Mohamed Zia, assistant professor of zoology, P.G. and research department of zoology, The New College, Chennai, who focused on “India in the Middle Ages and Muslims Influence”. The theme of this session was “First War of Independence and the Indian Masses”. Prof. Kapil Kumar chaired the session. While Prof. J. Raja Mohammed, former professor of history and curator of Pudukottai Government Museum, Tamil Nadu, spoke on “The Muslims of Tamil Nadu in the uprising of 1857”, Prof M. Afzal Wani, professor of law, GGS IP University, Delhi and assistant secretary general, IOS, spoke on “Development of Law in India after the First War of Independence”. Dr. Mohammad Ibrahim Naveed, associate professor of zoology, P.G. and research department of zoology, The New College, read his paper on “First War of Independence and the Indian Masses”. 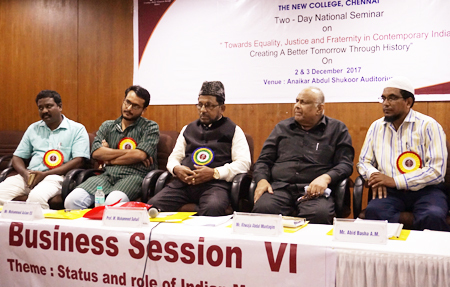 This session on “Status and role of Indian Muslims in nation-building” was presided over by Prof. M. Mohammed Suhail, former head, P.G. and research department of history and Principal, Islamiah College, Vaniyambadi, Vellore. While Khwaja Abdul Muntaqim, ex-visiting professor, Amity University and ex-director and additional legislative counsel, Government of India, enlightened the audience on “Status and Role of Indian Muslims in Nation-Building – A Pragmatic Approach”, Dr. J. Sulaiman, assistant professor and research supervisor, P.G. 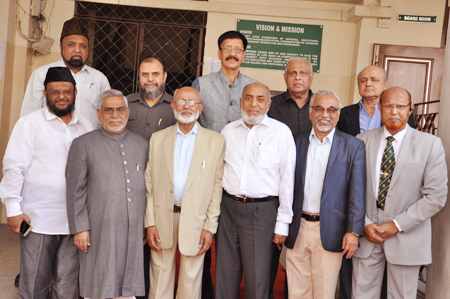 and research department of commerce, The New College, spoke on “Status and Role of Tipu Sultan in Nation-Building”. Muhammad Aslam ES, assistant professor, department of historical studies, The New College, presented a paper on “Liberation and Religion: Subaltern Perspective of Mapilla Resistance in Colonial Malabar”. 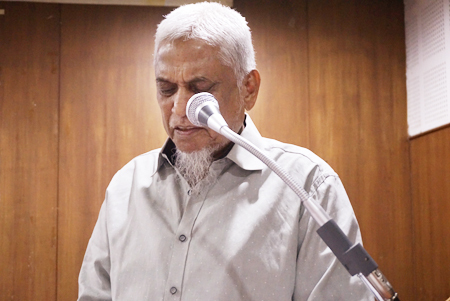 Abid Basha, A.M. assistant professor, PG and research department of commerce, The New College, Chennai, who was the last presenter at the session, spoke on “Status and Role of Indian Muslims in Nation-Building”. Prof. Refaqat Ali Khan, who delivered the valedictory address, held that the secular character of the state came under perceptible change during the 1999-2004 NDA government. In 2003, the Supreme Court held that it was the duty of the state to provide “instruction in religion” in its schools. This, in fact, was a death-knell for secular education, especially when the RSS-backed party was in power at the Centre and also in several states. He said that already schemes were in operation to create mythical history to inculcate hatred against Muslims. The forceful agitation against the screening of the film, Padmavati, was part of such a programme. The story of Padmavati conceived and written some five hundred years back by a Sufi poet, Malik Muhammad Jayasi, did not hurt the Rajput pride of legendary hero, Rana Pratap of Mewar, or of any other proud Rajput in any part of India. He maintained that India had a history, its development to its present socio-economic level had not been smooth or uneventful. No period of India’s history had been free from conflict of one kind or another. But such tussles or struggles were more on economic or political matters rather than on religion. Whoever be the invader, killing on both sides was natural. The contending sides were not exclusively Hindu or Muslim. The population of a town or the composition of the army was mixed. Under such circumstances, it was unhistorical to claim that “Hinds were killed and enslaved”, as had been done by many historians. He observed that it was not just writing of mythical and communal interpretation of ancient and medieval Indian history. Muscle power and money were being shamelessly used in a big way for suppressing objective and secular history. He concluded by remarking that the distortion of history by communal historians was a challenge to objective and positive understanding of history. Speaking as the guest of honour, the secretary of The New College, Al-haj Ashraf Saheb, noted that there was a difference between what the participants spoke at the seminar and what was being taught to our children in the class room. Hate campaign against a particular community was going on unchecked. Historians with a communal bent of mind distorted the history of people who ruled the country for 800 years. Describing Tipu Sultan as the hero of the freedom struggle, he said that Tipu never changed the name of Hindu temples. While Mughals never went back to their native land and remained in India with so much contribution to its art and culture, the British looted India’s wealth and enriched their country, he concluded. Presiding over the session, Chairman of the IOS, Dr. Mohammad Manzoor Alam pointed out that the campaign against Islam was not new. Muslims had been experiencing it for centuries. Expressing concern over the future of coming generations, he said that scholars had not deeply researched Islam. This was, in fact, an issue that could be tackled by a mega-project. This required coming together of historians and social scientists. He said that there was a deliberate move to exclude the contribution of Muslims from the Indian history. He also observed that no community could forge ahead if it did not possess intellectuals. Similarly, there should be a connect between intellectuals and common people. He informed that the IOS had decided that every publication of the Institute would be translated into regional languages, including Tamil, for the benefit of South Indians. 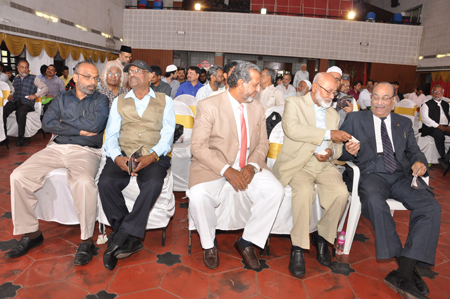 Outlining the policy of the IOS, he said that the Institute was constantly interacting with non-Muslim intellectuals. He called upon the young scholars to associate themselves with the IOS as it had ideas that could be worked upon. The IOS was ready to work hand in hand with them, he added. 1. It was stressed that history is to be understood in an objective manner with an honest mind and impeccable method. This seminar urges historians and academics to carry out researches aimed at promoting the composite culture and blocking the unchecked hate campaign unleashed by unscrupulous forces. 2. An effort may be made to bring like-minded persons and organisations together to create synergy for fostering ideals of equality, justice and fraternity in India through history. 3. The freedom struggle should be studied afresh where participation of the common man and woman should be emphasised. 4. An initiative to facilitate scientifically valid and methodologically correct historiography has already been taken by IOS. The ongoing project, under which three volumes on Indian Muslim participation in freedom struggle have already produced will continue well in foreseeable future. 5. To carry out its objectives and programmes, the IOS will coordinate with historiographers in all regions of India. 6. Preparation of a series of booklets and their web version on current issues in correct perspective is envisaged. 7. The history of popular and people’s movements has to be objectively assessed and introduced in schools and popularise the message and other details among people. 8. A concerted campaign is going on to relate Islam with political violence and terrorism. This seminar proposes to address this issue in future meetings with teachers, researchers and writers of history. 9. There are reports that there are huge piles of material in national archives relating to the Indian freedom struggle that these are not still sorted out or used. Serious efforts must be made to utilise the matter and produce relevant literature. 10. There may be efforts to establish working relations between IOS and other organisations to work towards using modern technology to prepare and disseminate material on relevant historical aspects.